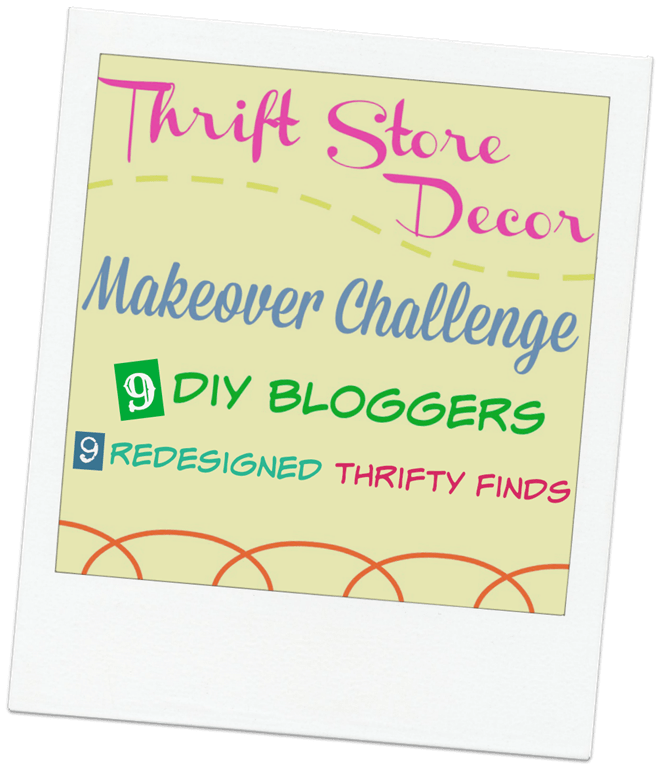 Welcome to Thrift Store Décor Makeover Day! I love this tour, theme, project…whatever you want to call it. 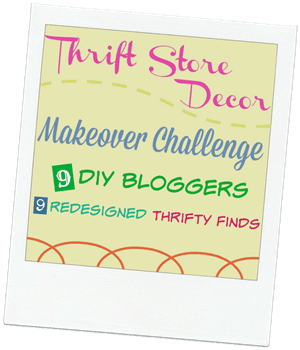 I love finding inexpensive things to redo or repurpose. I would much rather reuse something than send it to the landfill. My project today is so simple I hate to say it’s a makeover. I picked up this bucket for $4. Now some folks would just look at it as an old dinged up bucket. I look at it as a well loved treasure! The bucket was already worn through in a few places. I could see some pin holes of light when I was checking it out. The JTS drilled four drain holes. We don’t want drowned flowers. I have a hard enough time keeping plants alive as is. Ya’ll do notice I’m not a garden, plant, or flower blogger?? I purchased the flowers at Home Depot. Don’t ask me what kind they are. All I know is I like them. It’s Mum season but I’m not really a big Mum fan. I will have a few for Fall decorating because let’s face it….they give a lot of bang for the buck. I added a lot of potting soil to the bottom of the bucket then tucked in the flowers. That bucket sure was heavy. I forget how much dirt weighs. I added the burlap ribbon just because. The bucket didn’t really need anything else but who doesn’t like a little burlap. 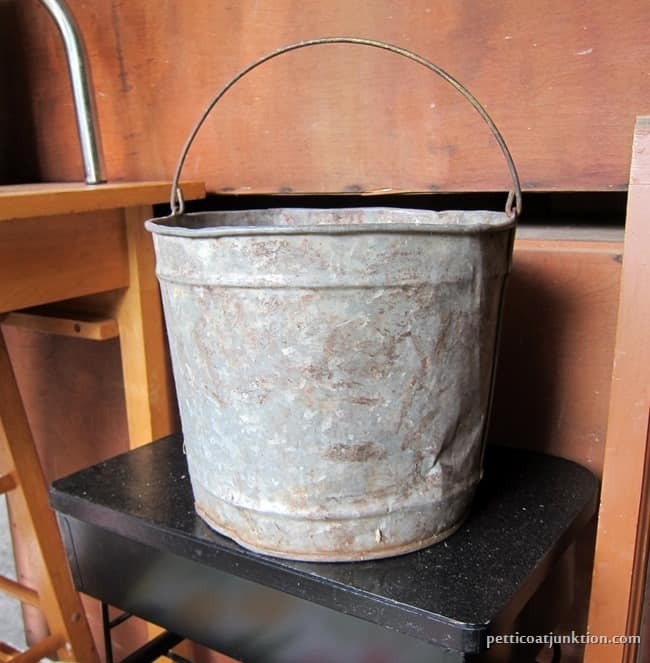 I’m thinking of making a small sign with our house numbers to add to the bucket. 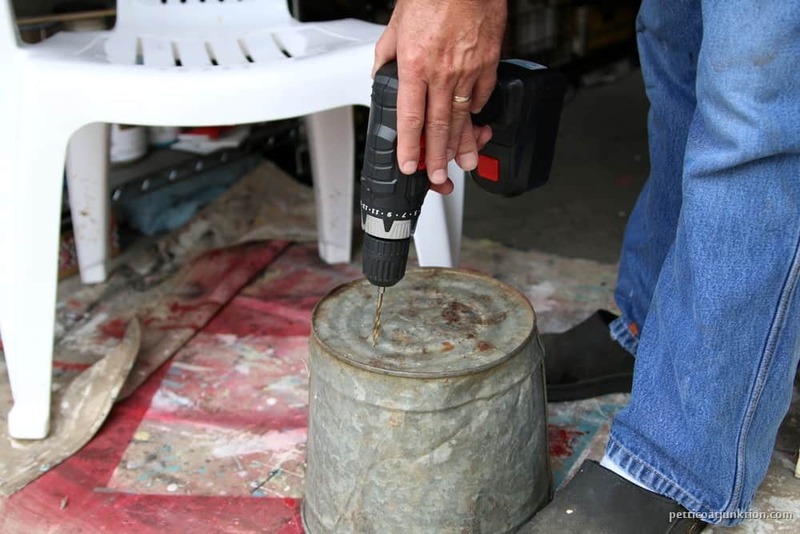 Maybe I’ll stencil a design on the bucket too. We’ll see. Time to take the tour. 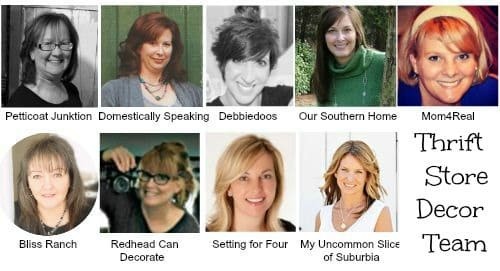 Click the “pink links” to see the thrifty projects from these talented ladies…. 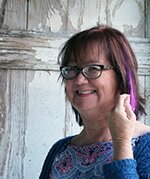 Sometimes the simplest makeovers are the best! This is just so beautiful! I think the burlap bow adds some charm to the bucket. It was charming enough without it, of course, but I like it! And I like that you drilled holes in the bottom. I too am awful at keeping plants alive. 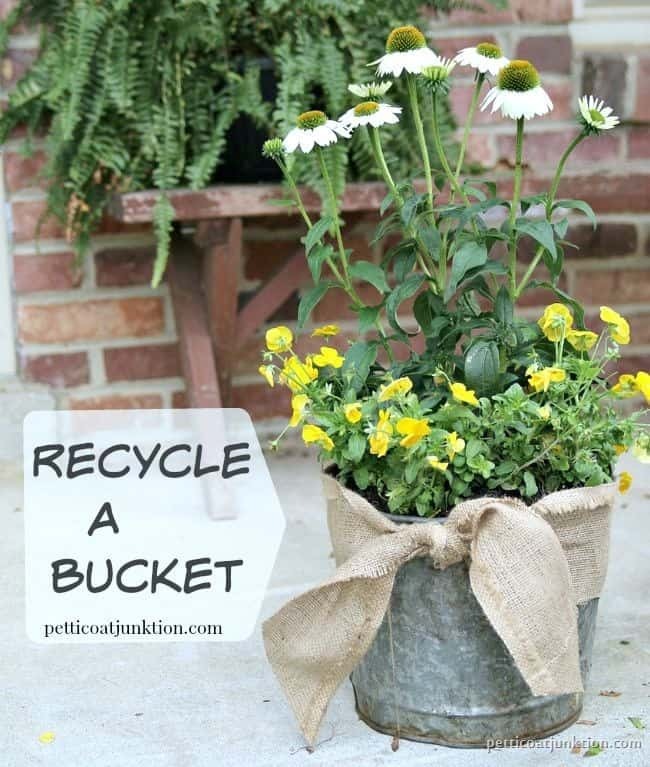 I drowned the cilantro plant I had… so I should probably do this too. so pretty Kathy! 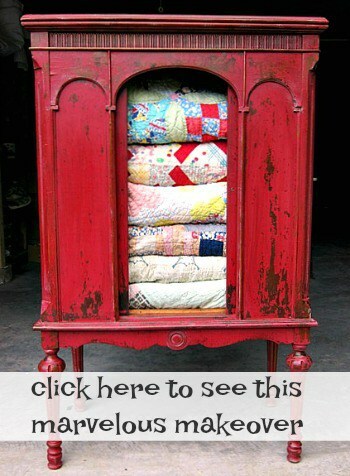 Love the tip to add holes to the bottom! Pinning! 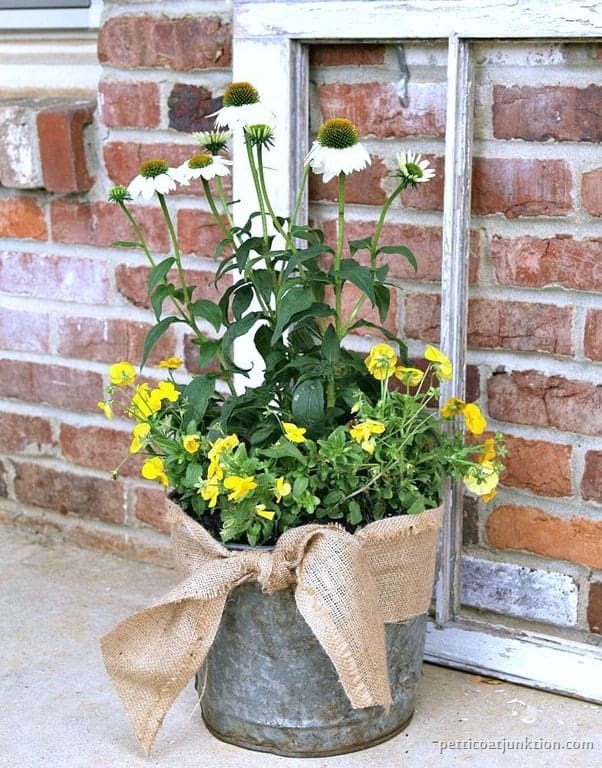 You can’t go wrong with burlap and a galvanized bucket… super cute! ah, I love you too Chris. You make my day. I have a lot of character too…it’s the dents and dings! Great idea Kathy! I wish I could grow fall flowers but there is no point here in the Canadian Prairies. We go from summer flowers still in bloom to freezing and not much in between. 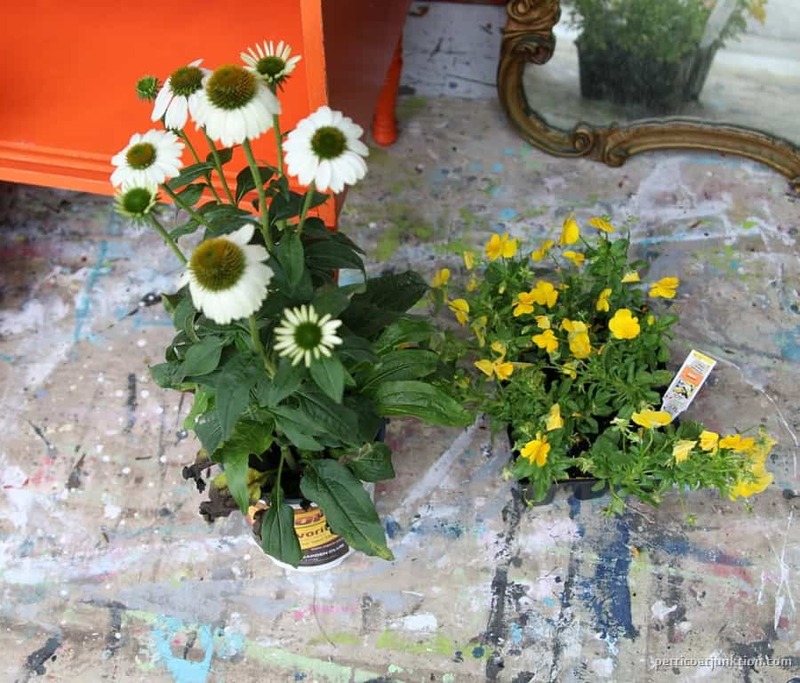 It looks like you planted coneflowers (perennial) and violas, a perennial also. They can be put in the garden late this fall and you will have these two beauties for the rest of your life! I love the old bucket and a bow always perks it right up! Gorgeous fall display. P.S. 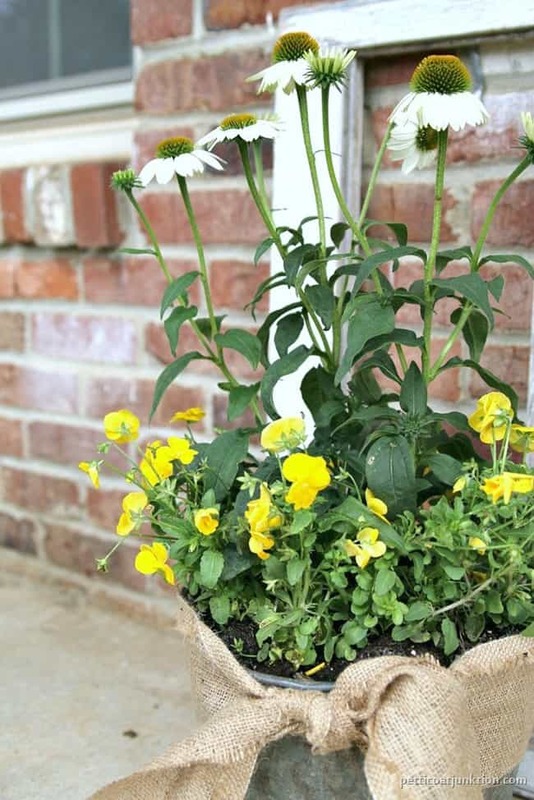 You CAN keep these flowers forever – just water well when you put them into the ground! Use styrofoam packing peanuts or bubble wrap in the bottom of your containers – great drainage and so light! I believe I thought of this all by myself and it’s worked well both inside or out for several years. I currently have 3 buckets with mums on my porch. I love the dings, those are the ones people pass by and they are perfect for flowers.